There’s little question why bucktails are the most popular style of musky lure. Bucktails can be fished fast or slow, in clear water or dark, shallow or deep, from season’s start to end. Their spinning blade and wiggling tail seem to hold a special fascination for muskies, and when the moment of truth comes and a musky strikes, they hook up with the efficiency of their being little more than a piece of wire and a hook. Bucktails are my favorite musky bait because when muskies are biting on them, they tend to be aggressive, and that means I’m going to catch more than one fish that day. While bucktails can be everything for muskies, there’s much more to using them than simply snapping one on a wire leader, casting it out and reeling it in. The first rule to bucktail fishing is knowing that each is a tool for fishing a different depth in the water column. Each blade style is unique in its flash and vibration, but the one you choose should depend on the depth of water you’re trying to fish. Remember that the rounder the blade, the more drag it creates when moving through water; therefore, less effort is required to make a round blade run shallow. Mepps makes bucktails that easily cover a wide range of depths. The Colorado-style blades of the Mepps Marabou and Mepps Musky Marabou require minimal effort to keep them just under the surface. Speed them up and they readily bulge the surface, which can be an effective musky trigger. On the other end of the spectrum is the willow leaf-style blade of the Mepps Giant Killer. Being long and thin, the willow leaf blade spins close to the Giant Killer’s shaft, yielding maximum flash but minimal drag, so the lure runs more deeply. Mepps’ famous Musky Killer and Musky Killer Tandem feature French-style blades that are extremely versatile. Speed them up and you can bulge the surface, slow them down and they’ll run more deeply. A common running depth for these lures is one to three feet. Finally, the Mepps Magnum Musky Killer is built with a heavy French-style blade that is 143 percent larger than the standard Musky Killer blade, so it offers a flash and vibration all its own. The heavier blade readily allows the Magnum to be fished more deeply than the standard Musky Killer. The next vital point to understand about bucktails is their tail. Mepps bucktails are unique in that they feature a jointed body style ‘ their tail is joined by a split ring to the body, which allows the bait’s tail to wiggle in a more lifelike manner during a retrieve. This jointed body style allows an angler to mix-and-match blade colors and styles with tail colors. With an assortment of Mepps bucktail bodies and tails, an angler will never be without a hot color when on the water. Mepps Marabous and Musky Marabous feature marabou feathers, which offer a lifelike action in the water, while Musky Killers, Magnum Musky Killers, and Giant Killers have tails tied with actual deer hair, dyed in a variety of colors. Whether to use marabou or deer hair depends on the mood of the fish ‘ some days they’ll show a distinct preference, other days it won’t matter. Marabous seem to get the nod when fish are somewhat less aggressive. When you cast, it’s important to synchronize your bucktail so that its blade is spinning and the lure is moving toward the boat the instant it hits the water. This will prevent the lure from fouling on itself or in shallow cover, but most importantly will often trigger a musky that is lurking where you just cast. To do this, thumb your reel’s spool just prior to the bait hitting the water and actually stop the spool just before the bucktail hits. Engage the reel instantly and begin the retrieve without hesitation. This will take a few casts to get the hang of, but is one of the techniques that separate successful bucktail fishermen from the rest. During the retrieve, speed the bucktail up and slow it down at least once. A burst of speed can trigger a following musky to strike, while slowing it down will cause the tail to puff out and appear more lifelike. Many bucktail afficionados will also incorporate a direction change at mid-retrieve to trigger following fish. To do this, begin the retrieve with the rod’s tip pointed directly at the lure, then sweep the rod 90 degrees to the side. If you spot a follower and it still doesn’t eat the bucktail after the direction change, sweep the rod 180 degrees to the other side to give the bait another change of direction. End every cast with a figure-8, making the loops of the 8 as large as possible while performing the maneuver as smoothly and deeply as possible. 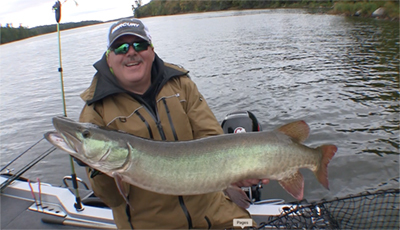 There are many figure-8 tricks that you’ll learn with time, but remember to do one regardless if you see a following musky ‘ you will be amazed how often you’ll catch a fish you never knew was there before it struck the bucktail. Finally, I like to add a Mr. Twister 3-inch Meeny grub tail to the back of my Mepps bucktails. Not only does this add more color but it gives the tail even more wiggle. In stained water I often use a luminescent glow-in-the-dark tail, even during the day. I don’t know why this works, it just does. If I use a color other than luminescent it will probably be one that matches the bucktail blade’s color (e.g. a chartreuse 3-inch Meeny on a bucktail with a chartreuse blade). Some of my favorite combinations include a chartreuse blade/black tail/chartreuse Mr. Twister trailer, an orange blade/black tail/orange trailer, a silver blade/black tail/glow trailer, a silver blade/white tail/smoke trailer, and a pearl blade/black and white Musky Tandem tail/glow trailer. You’ll note that all of the above are high contrast color patterns. This fits in with the research of Mepps Color Technology ‘ regardless of the water color studied in this research, high contrast colors were most visible. The trend in musky rods is for length. They allow longer casts, easier lure handling, and deeper figure-8s. A medium heavy action 7-foot-6 or 8-foot rod is preferred. I use either a St. Croix Avid AM80MHF (8-foot) or an Avid AM76MHF (7-foot-6). I pair this up with a St. Croix Avid AC300 reel, filled with PowerPro 65-pound test superbraid line. Although Mepps bucktails utilize high quality VMC hooks, and non-stretch superbraid line offers superior hooksets, it’s still wise to touch up the hooks with a beveled-edge hook file. File each hook from the barb to the point. 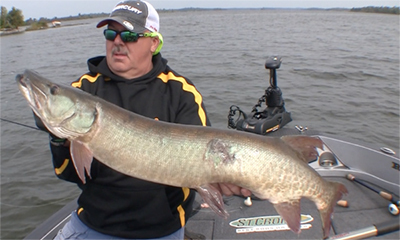 Muskies often do not strike a bucktail as hard as one would think. Sometimes they’ll simply inhale the bucktail and swim toward the angler, and the only thing he will feel is the blade ceasing to spin. Sometimes it will feel as if the bucktail is slightly hung up in weeds; sometimes all that will be noticed is the line moving to the side. The best rule to follow is to set the hook on anything that feels or looks different during the retrieve. Trust me, there are many fish that victimized me in just such ways that I wish I could have a second chance at catching. 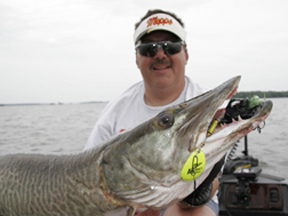 A final consideration pertains to Mepps’ Giant Killer, which has become one of my go-to baits during the past several years because they’ll incite strikes when muskies are following other bucktails. Often during seminars I will ask how many anglers in the audience use willow-leaf-bladed bucktails, and perhaps half of the the attendees will raise their hand. 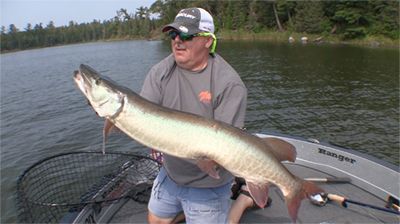 Since willow leaf blades are used less, muskies don’t see them as often and do not become conditioned to them. Mepps bucktails have long been a favorite of mine. I caught my first nine muskies on a gold-and-black Mepps Musky Killer nearly 30 years ago, and I still catch dozens of fish on them every year. 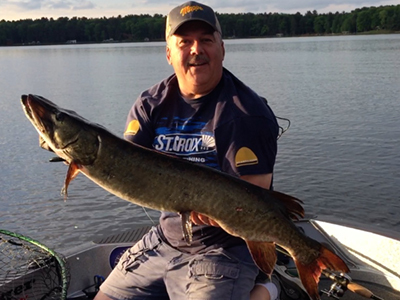 Many of these have surpassed the fabled 30-pound benchmark of a trophy musky. 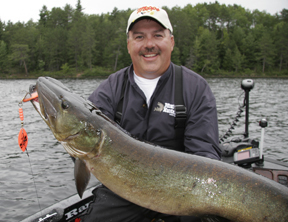 Follow these tips, and you could one day be the guy in the photograph with a smile as long as his musky.